The SCIMPI is in the hole! 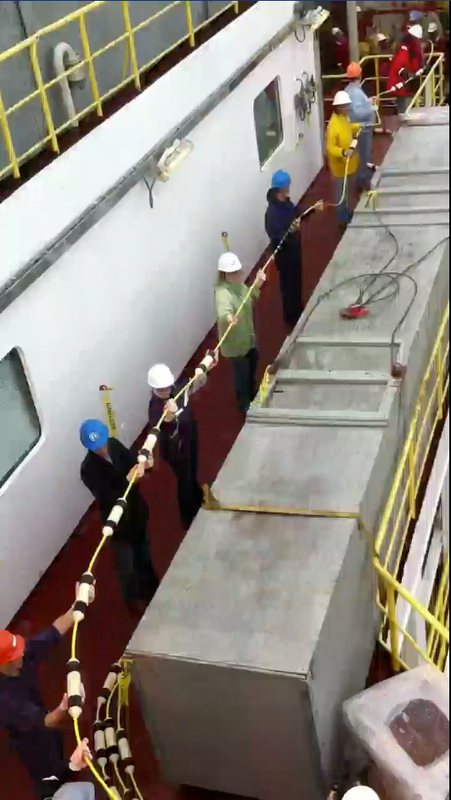 This screen capture from a video shows scientists, crew and educators aboard the JOIDES Resolution deploying an ocean floor observatory called a Simple Cabled Instrument for Measuring Parameters In-Situ or SCIMPI. It is what it’s name implies — a cabled instrument for making measurements about what is happening on and below the seafloor. It extends 247 meters (810 feet, or about the height of an 80 story building) below the seafloor, and is in a relatively shallow spot in the ocean. The ocean depth where we deployed (off the coast of British Columbia) is 1262 meter (4140 feet). The video is a time lapse of the observatory going into the drill pipe – it actually took a few more hours for the SCIMPI to be slowly lowered to the seafloor. Unfortunately, shipboard Internet is slow and more than a bit finicky, so the video hasn’t uploaded after several attempts. I can link to online video elsewhere, however, so here’s a little something to express our excitement. When I wrote most of this last night, the drill pipe was still extending from the JOIDES Resolution to the seafloor. The drill pipe was lifted in the middle of the night, and initially, the SCIMPI came up with it — just a few feet above the seafloor. When they recognized it was still in the pipe, they reinserted the pipe into the hole and managed to disconnect. The SCIMPI was then free and began collecting data. The SCIMPI will be visited in a few weeks by a Remotely Operated Vehicle (ROV) to check that it’s working properly. It is expected that in the not too distant future it will be connected to the NEPTUNE Canada Cable Network and be able to provide data in real time. What’s it for? Well, the data the SCIMPI collects will help us to better understand a range of issues — earthquakes, gas hydrates, and the geology of this unusual place in the world where tectonic plates meet to name a few.